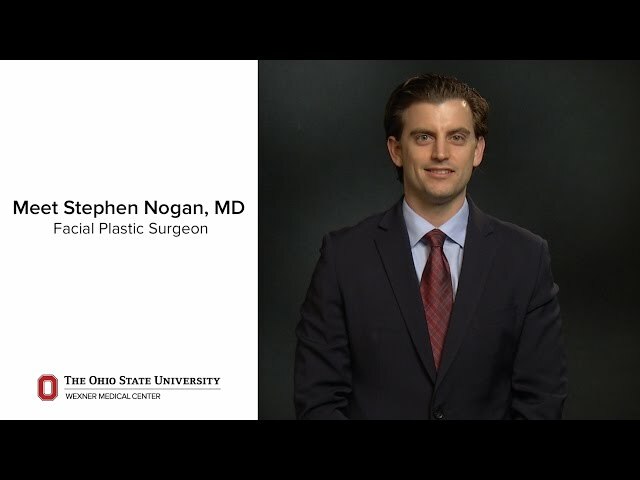 As a facial plastic and reconstructive surgeon at The Ohio State University Wexner Medical Center, I specialize in cosmetic and reconstructive surgery of the face and neck. My cosmetic practice focuses on face and neck lift, mini-lift, brow lift, blepharoplasty, rhinoplasty, otoplasty, skin resurfacing, liposuction, fat transfer, facial implants, fillers and cosmetic Botox. I also perform facial reconstructive surgery after skin cancer removal, facial paralysis and trauma resulting in any bony or soft tissue injuries of the face. In addition to my clinical practice, I do spend time working with several local and international charitable organizations, and I was recently selected by Columbus Business First to receive a Top 40 Under 40 award in the Class of 2018. I have spent the last seven years training and working at Ohio State, and I couldn’t imagine a better place to practice. The research mission of the medical center ensures that we will always be on the cutting edge of technology. The educational environment of the medical campus gives me the opportunity to help train the next generation of head and neck surgeons. Most importantly, the clinical and surgical facilities at Ohio State maintain the highest possible standards for patient safety and quality. My practice philosophy is pretty simple: to provide the type of personalized patient care that I would want for myself and my family. Dr. Nogan was very personable, patient, spent quality time explaining and making recommendations. He went over and above what I expected in a consultant and eventual treatment. Everytime I visit Dr. Nogan, I am more impressed with him. I've never seen a doctor more caring, personable and as outstanding in his area of expertise. I only ever had good experiences with Dr. Nogan. He was very kind. He was also very communicative during consultations and procedures. I had a great experience with Dr. Nogan and I have scheduled another appointment with him. Dr. Nogan has the best bedside manner. Makes me feel important when speaking to me. Excellent physician. As of 12/20/2018, Dr. Nogan has reported no relationships with companies or entities.